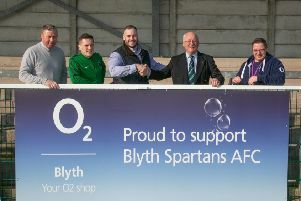 Despite a hesitant start to the game at Sutton Coldfield on Saturday and the subsequent 1-0 defeat, Blyth Spartans’ manager Tom Wade thought his side deserved to come away with a point. The home side won it with a Aaron Forde goal on 20 minutes, but the Blyth boss felt the playing surface did not give his side the best of starts. Wade said: “It took us half an hour or so to get used to the artificial surface. It’s a unique surface to have to play on. “Some of the Sutton Coalfield players were pretty average in the game against us at Croft Park, but on their surface they were like superstars. “It was, of course, disappointing though not to get off to a better start. “After 30 minutes or so we went on to create some half chances, getting balls into the box. Then, after the break we were totally on top but failed to score. “On reflection I think we went in to the game with a ‘footballing side’ and maybe the blend, the balance, wasn’t right. We needed more steel and fight. They were more physical than us and created some good opportunities. “Having said that we did show some good attitude but it was one of those days when you were thinking that it wasn’t going to be our day but we did hit the bar and probably deserved a draw. “The loss isn’t really a set-back. We knew we were going to lose games. We’ve only let ourselves down once or twice this season. “Alright, it’s three points lost, but no one would have had us down to win at Mickleover with just ten men. That’s just how football is.